The Deep Underground Neutrino Experiment may address important physics questions and change the way we look at our planet. The upcoming Deep Underground Neutrino Experiment may be able to measure the internal structure of Earth by looking at neutrinos from the sun that penetrate our planet. (Inside Science) -- Construction for the Deep Underground Neutrino Experiment, also known as DUNE, began this July and is scheduled to be completed around 2024. The $1.5 billion facility will be located almost a mile underground, inside the former Homestake gold mine in Lead, South Dakota. Scientists plan to use DUNE to find answers to some of the most important questions in physics today by closely examining the neutrino, one of the most poorly understood fundamental particles. DUNE will focus on studying some of the most fundamental questions in modern physics -- from why there is so much more matter than anti-matter in our universe, to how black holes can be formed by supernovae. But could this state-of-the-art neutrino detector be used for something else as well? In August, an international group of scientists published a paper in the journal Physical Review D with a rather novel idea -- to use DUNE as a scanner to study the internal structure of the earth. When finished, DUNE will have the largest and most sensitive neutrino detectors in the Northern Hemisphere. Four underground chambers -- each several times the volume of a Boeing 747 -- will house the detectors which contain altogether a whopping 68,000 tons of liquid argon that is cooled to a bone shattering -303 degrees Fahrenheit. Since neutrinos are extremely weakly interacting, the huge amount of liquid argon provides a large transparent volume for the neutrinos to crash into, so that scientists can observe and study them. But this is only half of the experiment. The other half will be located 800 miles away, at the Fermi National Accelerator Laboratory just outside of Chicago. There, a particle accelerator will hurl out neutrinos at nearly the speed of light towards the gigantic underground liquid argon tanks in South Dakota. Scientists are hoping to answer some of the fundamental questions in our universe, by carefully examining the neutrinos before and after the 800-mile trek, to see how these mysterious particles can interact with ordinary matter. But neutrinos don't only come from particle accelerators -- stars also make them in abundant quantities, including our own sun. The new research paper suggests that in addition to enabling scientists to study the properties of neutrinos, DUNE's detection abilities could be used to study the internal structure of the earth. 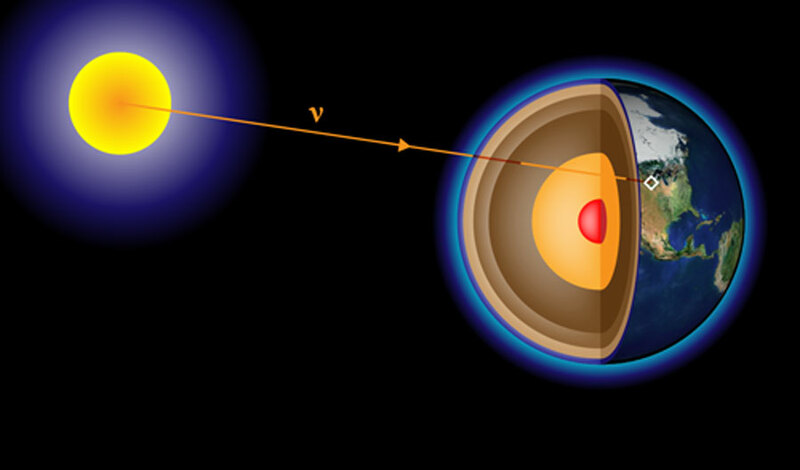 As the sun sets and its warm light is obscured by the Earth, neutrinos produced by the sun would keep on shining through our planet. According to theoretical calculations, only about 4 percent of these solar neutrinos are blocked as they fly through the planet. If this is true, a fixed neutrino detector should be able to detect the small difference between noon and midnight. "There is already existing data on this, but there are a lot of uncertainties [about these data]," said Ara Ioannisian, a theoretical physicist from Yerevan Physics Institute in Armenia and the lead author of the paper. According to him, results from current neutrino detectors have been somewhat puzzling when compared with theoretical predictions, but at the same time they are not conclusive enough to prove the theories wrong. Ioannisian and his colleagues believe DUNE's incredible sensitivity should produce a much more reliable measurement. Moreover, they think that DUNE may even be sensitive enough to observe a sudden change of solar neutrinos as their paths slice into a new inner layer of Earth as it rotates. "But there is still a very long way from using the neutrino data to learn anything new about the structure of the earth," said Arthur Lerner-Lam, a seismologist from the Lamont-Doherty Earth Observatory in Palisades, New York, who was not involved in the study. Even with the anticipated sensitivity of DUNE, the resolution of the Earth's internal structure obtainable using the proposed method will still be a far cry from what has already been done using seismological data. For now, the vision of Ioannisian and his colleagues remains a proof-of-concept proposal rather than a practical method for geophysical studies. However, because the neutrino is so different than the traditional methods using seismic waves, the new method may eventually be refined to the point where it could reveal previously unattainable details about the Earth's interior. "The detectors are going to be built anyway, so the data will be there for free," said Ioannisian. "Sure, they're not designed for geophysics, but if we can do geophysics with them, why not?" Editor's note: This story was edited to remove a reference to a now decommissioned 3.9 mile particle accelerator at Fermi National Accelerator Laboratory in Illinois. We regret the error.